The history of images depicted on Arab banknotes is a study of visualizing modern nationalism. Egypt, for instance, issued its first banknotes on April 3, 1899 while it was still under British occupation (1882–1952). Over the course of the twentieth century to date, Egyptian banknotes showed images either of famous Egyptian mosques or of Pharaonic sculptures. The 2010 Egyptian Banknote is emblematic of this combination of a religious landmark and antiquity. On one side, the note depicts the mosque complex of Sultan Hasan, and on the other it shows Great Sphinx of Giza built during the Old Kingdom. The ANS also has several earlier examples of related paper currency (2011.47.6). While Egypt continued to modernize, its Islamic and Pharaonic histories not only animated the nation’s landscapes, but also defined its identity. 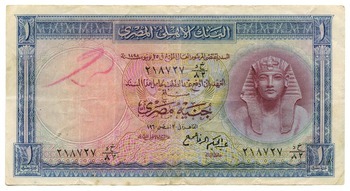 Egyptian banknote, 1 pound, 1960 (ANS 2011.47.6). Mahmoud Mukhtar’s Egypt’s Reawakening (Nahḍat Miṣr) is an especially rare image of a work of art found on a modern Arab banknote. According to art historian Alex Dika Seggerman’s research, Mukhtar (1891–1934) first sculpted a model of Egypt’s Reawakening in 1920 as a commemorative work for the landmark 1919 revolution of Egypt. Mukhtar made the model in Paris for the 1920 Salon of French Artists. Egyptian students visiting Paris were moved by its symbolism and came back to Cairo to campaign for its large-scale public commission. The sculpture made of locally sourced granite was eventually installed outside of Cairo’s main train station in 1928, and subsequently moved outside of Cairo University in 1955. In Egypt’s Reawakening a strong Egyptian peasant woman (fallāḥa) opens her veil to listen to the cries and hopes of the Egyptian public. With her steady hand she—the woman as nation—is connected to the symbolic historical artifact. This uplifting image of strength appeared on the 25-piastre (qirsh) banknote that had a short-lived issue from 1967 to 1976. The first issue of this currency (1967–1969) also featured a 50-piastres note with the al-Azhar mosque on one side and a statue of Ramses II on the other, consistent with the mosque/Pharaonic combination that dominates most of Egyptian currency. While the gesture to Mukhtar’s nationalist sculpture on an Egyptian banknote may be seen as remarkable, its Pharaonic imagery assimilates it into the broader canon of designs for paper money. Although the depictions of Ramses II or the Great Sphinx are of great ancient sculptures, they are mediated through their modern designs appearing on paper money codifying them as part of a nationalist vocabulary. Mukhtar’s sculpture materializes these forms with another layer of mediation by adding a reminder of the present, the peasant woman, and demonstrates how powerful imaginings can become a poignant national symbol when evoking the past as a vision for the future. For an erudite analysis of this sculpture see Seggerman 2014. Seggerman, Alexandra Dika. 2014. “Mahmoud Mukhtar: ‘The first sculptor from the land of sculpture.” World Art 4:1, 27–46. ibid. “Mahmoud Mokhtar.” Mathaf Encyclopedia of Modern Art and the Arab World. Whistler’s Mother. There are few works like it, artist and subject fixed in the public’s mind through repetition in the popular culture: advertisements, cartoons, dorm room posters. Think Da Vinci’s Mona Lisa, Van Gogh’s Starry Night, and Michelangelo’s David. Dali’s melting watches and Warhol’s soup cans. I think it is safe to say, though, that the general public probably knows very little about Whistler compared to these other artists. How many could even come up with his first name? (James, though his bohemian friends in the Latin Quarter called him Jimmy!). While his most famous painting may be stark and somber, Whistler’s life had all the color, passion, and tempestuousness we expect from our artists. You could call him American, but by the age of nine he had already left the country, first to Russia and later to Paris and London, where he made his reputation. He returned to the United States briefly at seventeen for a failed stint at West Point. With a greater interest in drinking and carousing than studying, he accumulated demerits for lateness, card playing, wearing his hair long, and laughing at inappropriate times. This and a flunked chemistry exam led to his expulsion in 1854, despite appeals to the academy’s superintendent, Robert E. Lee, who in the past had been willing to forgive his transgressions. Whistler began giving his works musical titles in the 1860s. The first was Symphony in White, no. 1, a portrait of a young woman in full figure with a white dress against a white background. He also became known for his “nocturnes,” hazy meditations on nighttime scenes that had to be painted from memory in the next day’s light. The official title given to the portait that came to be known as Whistler’s Mother was Arrangement in Grey and Black, no. 1. The painting was purchased by the French state in 1891 and can now be found at the Musée d’Orsay in Paris. I came across Victor David Brenner’s 1905 medal of Whistler while researching an article on the collector Robert Eidlitz, its original owner. The portrait is one of Brenner’s best, nicely capturing, in the words of cataloger Glenn Smedley, “the vainglorious, belligerent egotist who bickered with critics and writers.” The legend on the reverse, “Messieurs les Ennemis!,” was fitting for an artist who called his autobiographical book The Gentle Art of Making Enemies (1904), which documented his interpersonal battles that played out in the press, including a libel suit against the critic John Ruskin. And what about that peacock? A common enough Victorian motif, its relation to Whistler would have been instantly recognizable to anyone familiar with the goings-on in the art world at the time. It relates to a commission he received in 1876 to complete the decorative work on a dining room in shipping magnate Frederick Leyland’s London home. Whistler threw himself into the job, obliterating much of the work that had been accomplished already, replacing it with golden plumage patterns and two large gold and blue peacocks. His patron balked at paying for the unrequested additional work, so Whistler doubled down, covering more of the work in blue paint and adding a twelve-foot allegorical mural portraying two more peacocks, one representing Leyland in full rage—his greed manifested by the coins adorning its body and at its feet—the other himself striking a dignified pose. So how did it turn out? If you are in Washington, D.C., you can see for yourself. The Peacock Room was acquired by the Smithsonian and has been open to the public since 1923 in the Freer Gallery of Art, which is, appropriately enough, free! For more on Whistler and the Peacock Room see Daniel E. Sutherland, Whistler: A Life for Art’s Sake (2014); Stanley Weintraub, Whistler: A Biography (1974); and Ed Rochette, “Artist’s Sarcasm Captured in ‘The Fighting Peacocks,’” Numismatic News (August 4, 1987). Vincent Willem van Gogh was born on this date in 1853 near Breda in the southern part of the Netherlands. It was not until his late twenties that he began to paint in earnest. Before taking his own life at the age of thirty-seven, Van Gogh produced a huge volume of drawings, watercolors, and oil paintings. Many of the latter have of course come to be regarded as iconic works of modern art, even though his work was largely overlooked during his lifetime. The American Numismatic Society holds a fine medal commemorating the centenary of his birth by the Dutch artist J. B. Gutterswijk (1924-1987). The portrait of Van Gogh on the obverse I think captures something of his troubled brilliance, and seems to be based on the famed self-portrait now at the Art Institute of Chicago. The reverse features a field of wheat, alluding to the many compostions of his in which they featured, along with two quotations. The prominent legend, LONG ARS VITA BREVIS, is a Latin version of the first lines of Hippocrates Aphorisms, which is usually translated as “Art is long, life is short.” The smaller inscription below the field reads | mon travail à moi, j’y risque ma vie | “my very own work, I’m risking my life for it.” This is a quote from a letter that Vincent wrote to his brother Theo in late July 1890 just days before his untimely death. For a fascinating look at Van Gogh’s life and art, check out the wealth of wonderful materials made available via the website of the Van Gogh Museum here.